He glanced up the way to the parking lot beyond the wall. His was still the only car there. Then he turned and followed the walkway further down the hill, past the church building. Partway down the hill a modern bench sat amongst the ancient graves, overlooking the secluded little niche containing the group of three wells. They were all clustered together, with fairly recent fieldstone platforms and walk around them. Darnell went down directly, paused just before the first of the three. There were simple little white crosses painted onto some football-sized rocks beside the path. Small ribbons and bells were tied to trees and bushes nearby. On some of the rocks, and on the edges of the platforms, were the burnt-ends of candles. Clearly, this was still a place of pilgrimage. He stepped onto the narrow platform, and once again could feel that strumming, that flowing energy he had felt in St David’s. Some yards away, sheltering the site from the outside world, were thick curtains of vines, still full leafed and deep green from summer, draping down from massive ancient trees. This added to the sense of the place being somewhat apart, special. 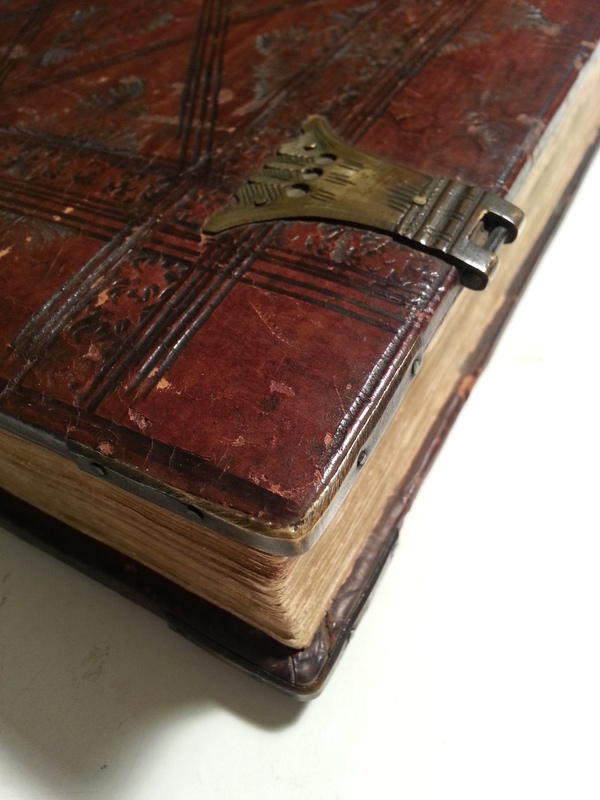 He knelt down, reached his hand to the surface of the first well. It bubbled slightly, but was otherwise clear and without a strong odor. He could feel a brightness, a clear sparkling energy to it. The middle spring was slightly cloudy, with a ruddy kind of moss all along the bottom and sides of the pool and the little stream which left from it. Placing his hand lightly on the surface, he could feel a deeper, somewhat darker energy. Not darker in a negative sense, but one of earthiness, like the rich loam of a well-cared-for garden. The third and lower spring had some element of that ruddiness to it, but it also had a distinct aroma of sulfur – distinct, but not overpowering. Touching the surface of that pool Darnell felt what could almost have been heat, though the water was still cool to the touch. Rather, it was as though the energy was intense, as if it were coming from a fire. Kneeling there, reaching down, it almost felt like praying. He smiled to himself, and got up. Going back up the path, he sat on the bench overlooking the wells, and considered them. Brightness, sparkling, as in the air. Richness, as the loam of the earth. Intense, as in fire. All bound together with water, flowing and mingling. Little wonder this site was still on the pilgrim’s path. Even our nonfiction perpetuates this idea that the way we are today is the way we’ve always been, or will ever be. I saw my first few episodes of Cosmos this week, a show I probably would have interrogated less before I started untangling the stories we tell ourselves are history. As with every other depiction of “early humans” this one showed a recognizable, to us, family group: women holding children, a couple men out hunting, maybe grandma off to one side. They looked like the limited family groups we knew from popular media, instead of the likely far more complicated ones that they moved in during their time: four women and two men stripping a carcass, two men out gathering, an old man watching after the children, two old women tending the fire. The truth is that every archaeologist and historian is limited by their own present in interpreting the future. So when Americans and Europeans talk about early humans, they don’t talk so much about early humans in Africa, even if that’s where we all came from. When we talk about early humans, they’re always hairy, pelt-wearing pale folks hacking out a living on some ice sheet. The men are always out hunting (like good 1950’s office workers!) while women stay in camp to dawdle babies on their knees. In fact, small family groups like these could not afford truly specialized roles until the advent of agriculture. Before that, folks needed to work together even more closely to survive — every member pulled their weight, whether that was looking after young children, gathering food, or herding some big mammal off a cliff and stripping it for meat. Down at the end of a cul-de-sac was his family’s residence. A couple of the large, old homes which were built in the ‘90’s served as the bookends of the compound, with additional structures between and behind them forming an open triangle. Group families of various configurations had become the norm in the few decades since the flu. Almost everyone who survived the flu was left infertile, even the very young, and the children who were born were themselves likely to be infertile. Children had become critically important, treasured above all else. Group families formed naturally as a way of raising more children in a secure environment, with shared responsibility. Those adults who were fertile came to be cherished and protected by the others. Couples still tended to pair-bond, as in Jon’s family, but formed a small collective, or extended family structure. In some ways it was an older form of the family, a survival strategy from deep in mankind’s racial memory. And, unsurprisingly, even this fairly tame variation on what a ‘family’ is has gotten criticism from some reviewers. Anyway, Hurley’s piece isn’t very long, and is well worth the read. 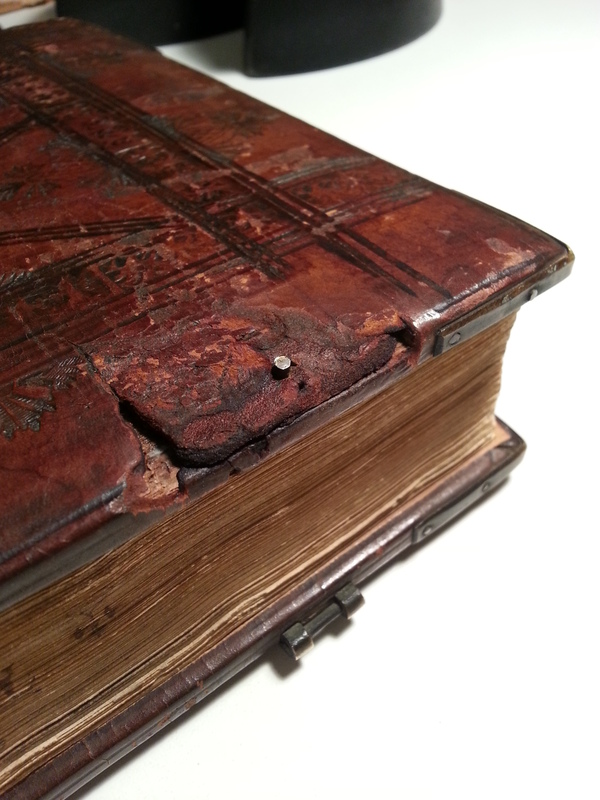 Been a little while since I did a book conservation post. So let’s have some fun. 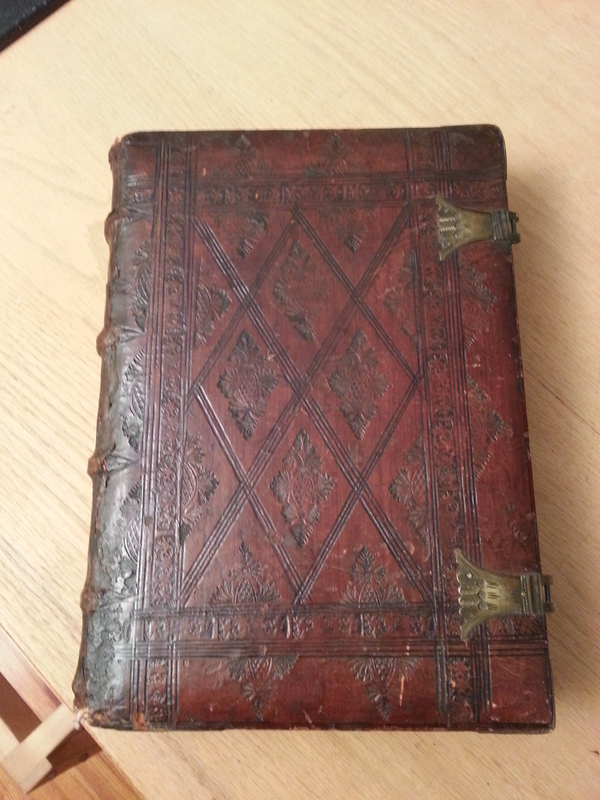 Recently I had this item come in for some minor work: Summa contra gentiles by Thomas Aquinas, printed in Venice in 1480. 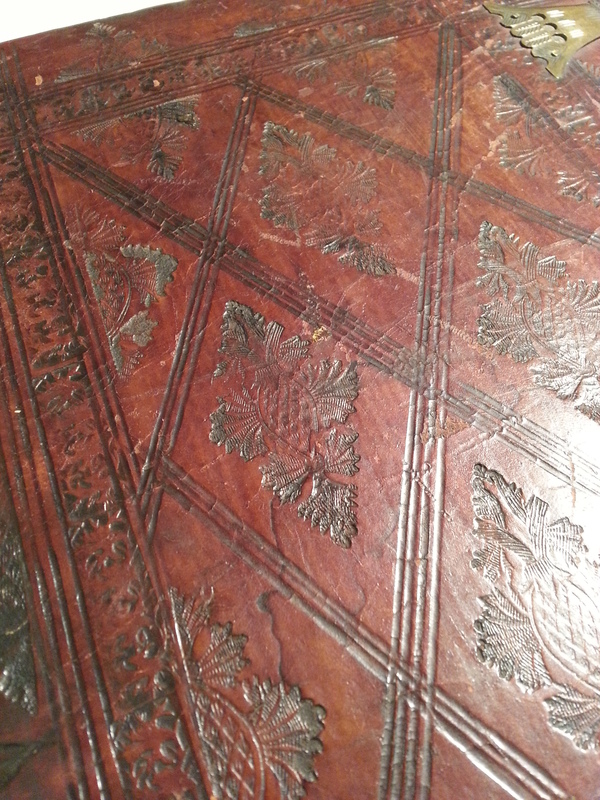 That makes it an incunabula, one of the relatively rare books published before 1501 (in this case, just a quarter century or so after the Gutenberg Bible). 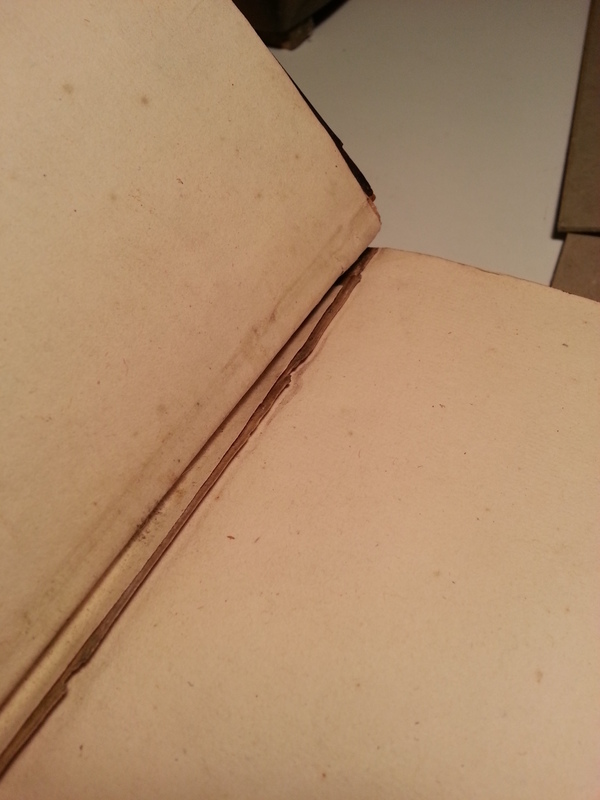 Even more noteworthy, this book is still in its original binding. 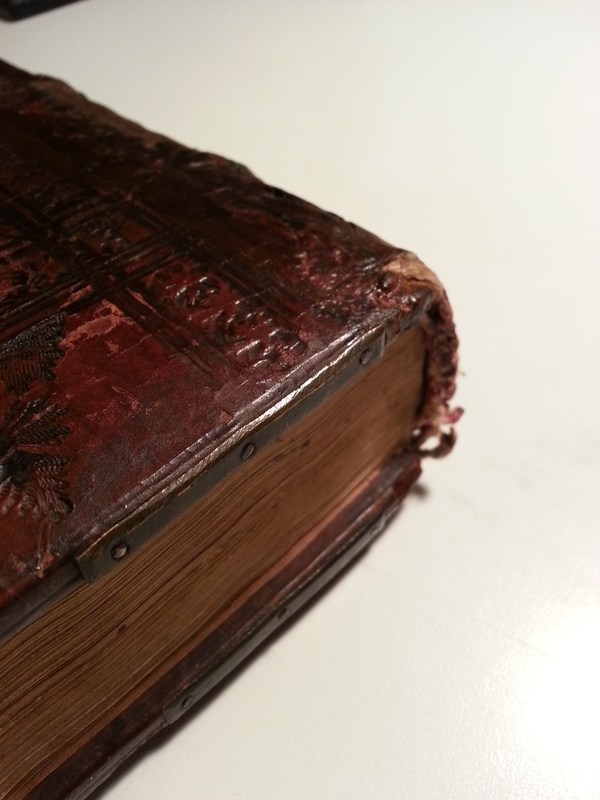 And that binding is in remarkably good condition. It’s a little hard to tell what it is you’re seeing there, so let me explain. 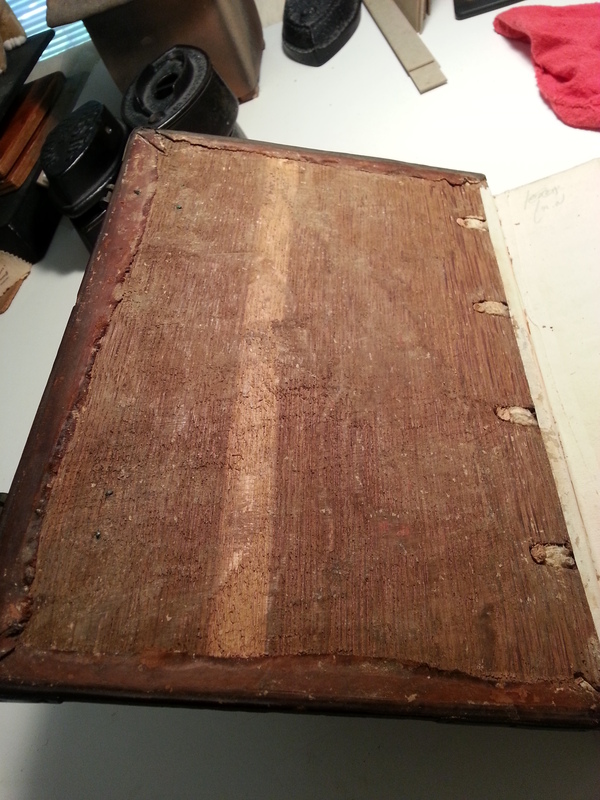 The darker strip is the outside edge of a piece of vellum which has been adhered to the spine of the text block. 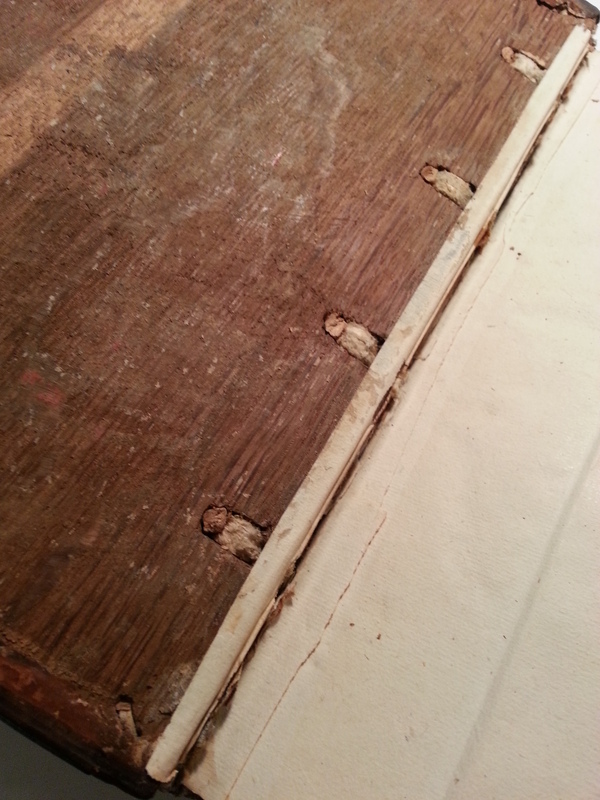 This was added *before* the supporting strips of alum-tawed goatskin were laced into the wooden covers, and just serves to help protect the exposed sewing thread. 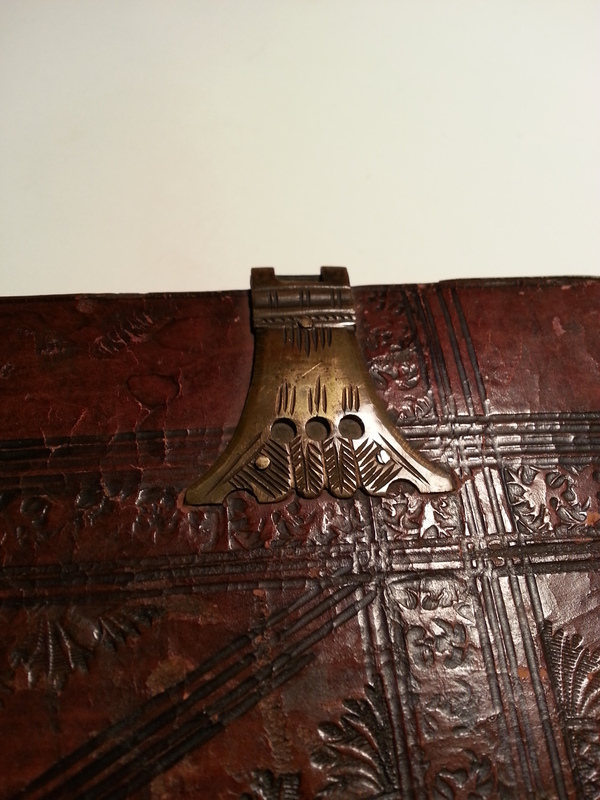 So, there you have it: a perfect example of late 15th century binding. 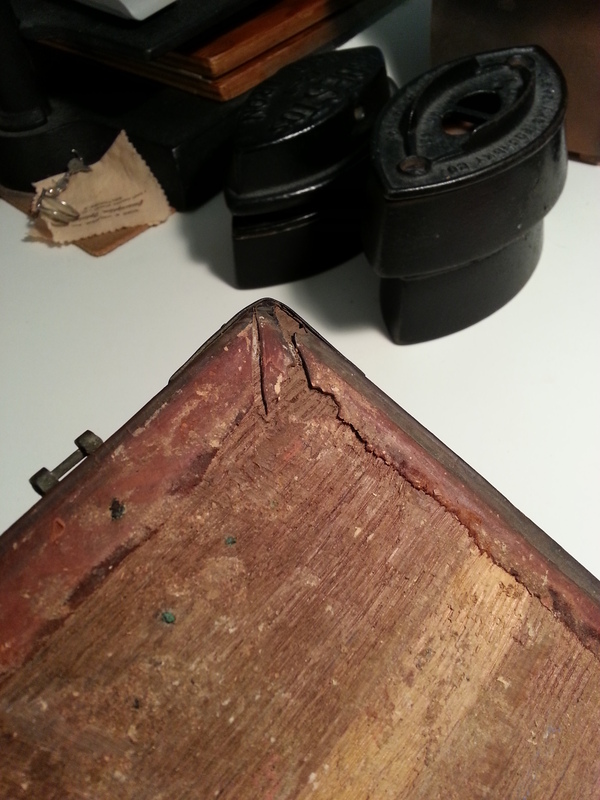 Just like all the history books (and book conservation training) says it should be, but exposed by me today for the first time in probably 200 years or so. Fun stuff. Have I mentioned recently how cool my job is?